A hole caused an airliner to make an emergency landing in the US, the National Transportation Safety Board has said. The flight from Arizona to Sacramento, California, was forced to make an emergency landing after a sudden drop in cabin pressure. A spokesman for the Federal Avidation Administration (FAA) said the cause of the decompression was not immediately known. But the National Transportation Safety Board has said an "in-flight fuselage rupture" forced the plane to make the emergency landing. Ian Gregor, from the FAA, said the pilot of the Southwest Airlines plane "made a rapid, controlled descent from 36,000 feet to 11,000 feet after the incident occurred". Some passengers aboard the flight from Phoenix Sky Harbour International Airport said a hole in the cabin caused a rapid descent. "It dropped pretty quick," said Brenda Reese, who provided mobile phone photographs of the cabin damage in the Boeing 737. 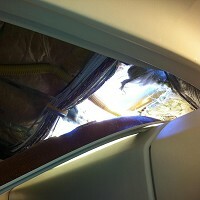 The pictures show a panel hanging open in a section above the plane's middle aisle, with a hole of about six feet long. Dallas, Texas-based Southwest said there were no injuries among the 118 people aboard, but Ms Reese said "there were some people that were passing out because they weren't getting the oxygen". Authorities said the plane landed safely at Yuma Marine Corps Air Station/International Airport, 150 miles south west of Phoenix and about 40 minutes after take-off from Sky Harbour. Such unforeseen events highlight the importance of ensuring you have good travel insurance cover before setting off on any trip.